More than 700,000 Mississippi adults have high blood pressure (hypertension), and thousands more may be at risk. High blood pressure increases a person's risk of heart disease and stroke, two of the leading causes of death in the United States. It can also lead to kidney disease, blindness and mental impairment. High blood pressure can be controlled or prevented entirely by taking the right steps. Hypertension affects all ages and races. Prevention begins with knowledge: find out your blood pressure, and learn the ways to keep it under control. This page will tell you how. Simple steps can prevent high blood pressure or keep your hypertension under control. Maintain a healthy weight, keep active, and eat wisely for good heart health. If you're under a doctor's care for high blood pressure, remember to take your medication as directed. Be sure to talk to your doctor about all the ways you can lead a heart-healthy lifestyle. Visit your local health clinic, come to a health screening event in your area, or check your local pharmacy or other stores for blood pressure machines. Having your blood pressure checked is quick, easy and painless. Starting a healthy lifestyle early in life helps prevent high blood pressure and its complications as you age. Eating right, keeping a healthy weight, and staying active are recommended for all ages: children, adults and seniors. 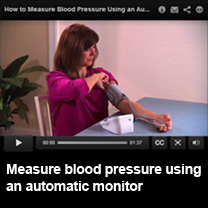 You can monitor your own blood pressure at home. Regular monitoring can alert you to problems early. A blood pressure level of 140/90 or higher is considered high. About two-thirds of people over age 65 have high blood pressure. If your blood pressure is between 120/80 and 139/89, then you may be at risk of developing high blood pressure, or hypertension, in the future. You can take steps to prevent high blood pressure by adopting a healthy lifestyle. High blood pressure can affect the brain and cause strokes. It can lead to vision impairment or blindness. It can damage the kidneys and put you at risk for heart attacks. Does high blood pressure run in families? Yes. You are more likely to develop high blood pressure if your parents suffered from it. You are at higher risk if you have a family history of early heart disease (before the age of 65 in women, or 55 in men), or family history of stroke. Am I at higher risk? High blood pressure occurs more often among African-Americans than other groups. It begins at an earlier age, and is usually more severe. African-Americans also have a higher death rate from stroke and kidney disease. Having your blood pressure checked and practicing heart-healthy habits are especially important if you are part of this high-risk group. High blood pressure can affect many parts of the body besides the heart. Brain: Very high pressure can cause a break in a weakened blood vessel, which then bleeds into the brain. This can result in a stroke. If a blood clot blocks one of the narrowed arteries, it can also cause a stroke. Eyes: High blood pressure can eventually cause blood vessels in the eye to burst or bleed. Vision may become blurred or otherwise impaired, or be lost entirely. Arteries: As people get older, arteries throughout the body "harden," especially those in the heart, brain, and kidneys. High blood pressure is associated with these stiffer arteries (atherosclerosis). This, in turn, strains the heart and kidneys. Heart: High blood pressure is a major risk factor for a heart attack. The arteries bring oxygen-carrying blood to the heart muscle. If the heart cannot get enough oxygen, chest pain, also known as "angina," can occur. If the flow of blood is blocked, a heart attack results. High blood pressure is also the number one risk factor for congestive heart failure. Find out more about how you can be tested for high blood pressure, and what you can do about it. Call our Office Of Preventive Health at 601-576-7781 or our Information Hotline, 1-866-HLTHY4U.